Today, I joined the Asatru Folk Assembly organization, the way of my ancestors. I have decidedly and finally come home. Hamingja - What Is It? At its most basic, this is a person’s luck. More specifically, it is “family luck”, meaning that it is is inherited through the family line. Hamingja affects our wyrd. Rather than luck, which is generally how it is described by most authors, it may be better to think of it as personal spiritual energy, given to each one of us, through inheritance, going back to the original first people created by Odin. Hamingja is sensitive to one’s actions in this lifetime. Righteous action has a positive effect upon a person’s hamingja, and feeds their energy. One’s hamingja can also be strengthened by daily devotions and other personal rituals. The rituals of the Year Wheel, so common to European pagan practice will also strengthen our personal luck reserves, as will living with the seasons. 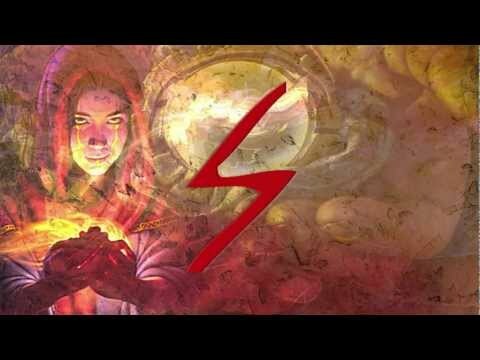 Energy raising activities such as blots, sumbels, and galdr can turbocharge your Hamingja for a little while – so can initiations. These are the spiritual equivalent of a dose of Red Bull. As you go through life, be aware of hamingja, because its existence with your wyrd and ond is symbiotic. We will all screw up and do some rotten things from time to time. That is simply life. When we consciously strive to increase our hamingja by living true and by accepting responsibility for our actions, we will find that those trips off the path will occur less and less, as we attract better and better into our lives. My hand forged Thor's hammer w/ oath ring (to hallow my Troth-claiming blot). ... (his name) was Loridi (my real name is Lori), who resembled his (her) father ... his son, his son (and more) ... his son was he is named Voden (Odin). Loridi means "the loud rider" and/or "the loud weather god" and is another name for Thor. My ancestral genetic motherline is U5b1b1, the foundational haplogroup of Saami motherline one. Perhaps I am a soul daughter of Thor as well. My Deep Ancestry Autosomal Genetic Results. According to Snorri Sturluson (Icelandic historian, 1179-1241), the Germanic god Odin's roots can be found in Turkey, also called Anatolia or Asia Minor. The ancient Germanic tribes called it Turkland. The god Odin moved in the second century BCE to the ancestral Germanic tribes of Northern Europe. The people we related to today as Turks did not arrive (in Turkey) until the 9th century, about 1000 years after Odin left the area. On his journey from Ukraine and Russia, Odin settled down in what is today northern Germany. According to Snorri Sturluson, Odin ended his journey in Sweden, where he founded the dynasty of the House of Ynglings through his son Yngvi-Frey. Odin's settlement in Sweden is also confirmed by the Danish historian Saxo Grammaticus (c. 1150-1220) in his Gesta Danorum. The graphic shows my own deep ancestral origins to be Sweden. My Middle Eastern Panel drills down into the data and reveals autosomal genetic matches for me in Turkey (Anatolia) and Armenia (a part of ancient Anatolia). My motherline genetic results show genetic matches to me in the Ukraine, Russia, Iran (think Azerbaijan, the Aesir) and Germany - all of the areas of Odin's migration route, demonstrating that my ancestors traveled the ancient migration JUST LIKE ODIN. Odin's journey is the journey of my own ancestors! My hand forged Mjolnir with oath ring to be used in Troth-claiming ritual. Not only is this upcoming Hleifblot going to be my first ritual blot (cyclical ritual blessing), but it is also going to incorporate a rite of Troth-claiming. 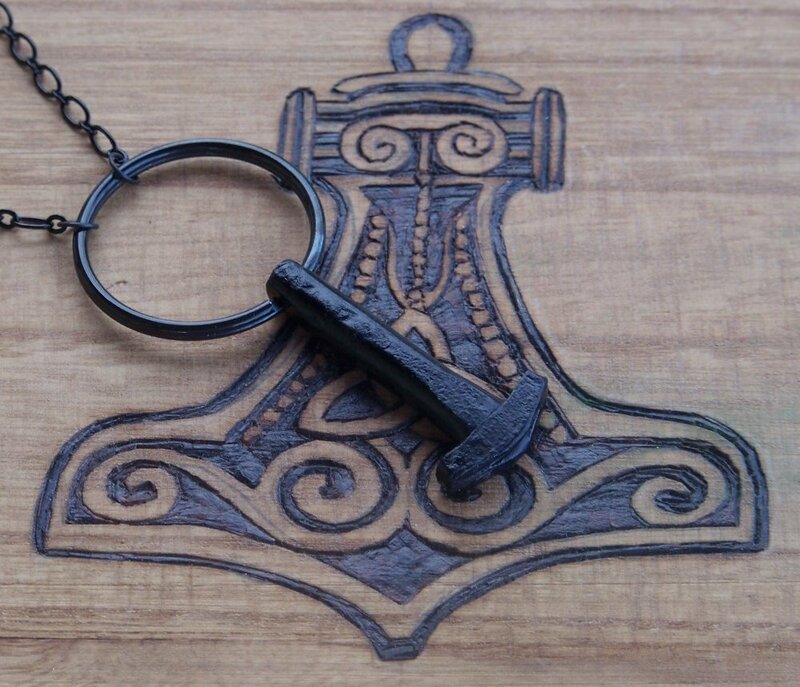 Shown is the oath ring and hand forged Mjolnir I am going to consecrate and use for my rite of Troth-claiming. I have several fancier and more costly hammer pendants, even a historical replica Erikstorp Thor's Hammer, but this hand forged one with the oath ring attached is my favorite. I also have a large 6 inch rune-inscribed altar oath ring on its way to me, but it's unlikely to arrive in time, so I'll consecrate it at a later time. I am going to perform the Troth-claiming rite despite that my ancestral genetic results show my ancestry to be nearly 100% European including Iceland (with traces from other areas of the world*), with a Scandanavian motherline of U5b1b1. I am doing this to firmly demonstrate with intentionally focused action to my ancestors my loyalty to them. Like so many others, I was raised Christian. I formally and ritually rejected Christianity in 1997, and entered upon a path of acceptance of my own ancestral heritage at that time as well, so my Troth-claiming ritual verbiage may be a bit different than most others in that particular area, since the verbiage given (in the book noted below with an outline of the ritual) applies to one coming directly from a path of Christianity (which I am not). Not a Christian, and having already ritually rejected that path a very long time ago (and remaining firm and true to that rejection over the years), my ritual words will pertain more relevantly to my own true situation, to taking up the Troth of my ancestors, and to swearing an oath of loyalty to them. My Troth-claiming ritual will basically follow the ritual as outlined in Volume 2 of Our Troth, compiled by Kveldulf Gundarsson (a ritual similarly outlined by Edred Thorsson in A Book of Troth). I will also ritually accept my sacred name Heid at that time, in an additionally incorporated naming ritual. This upcoming blot is full of good things for me. I'm so excited!. I have everything I need ready and waiting. The great majority of us come from families that have been Christian for dozens of generations. Indeed, those who pride themselves on their European ancestry should remember that nearly every living person with European ancestry has Charlemagne - who was not only a Christian, but a slayer of thousands of heathens - as an ancestor, whether or not the link can be documented. Therefore, even those who can trace their ancestry back to the time when our Heathen Troth still flourished must ritually take up the might of those early kin and lay claim to the worship of our forebears' gods and goddesses, just as those who do not share in the bloodline of their clans must. I'm also going to blood my runes at this blot. *Clarification, I should have written "nearly" 100% European, as I do have some genetic relationship to other areas of the world in trace amounts (including North Africa, Asia and the Middle East), such that Family Tree DNA reported my autosomal genetic ancestry results as 100% European statistically. DNA Tribes reported me as essentially of Teutonic (Nordic and Celtic) ancestry as well. So, two independent genetic testing companies are in agreement as to my ancestry. A third ancestral genetic testing company, namely Roots for Real, confirmed my motherline. As noted in my previous post, my father's Norse name, connected to Odin, means "Son of Night." Wyrdly, my patroness is the giantess-goddess Hela, also known as Mother Night, like the first night of the twelves nights of Yule. Interestingly, also related to Odin, Yule is a time for swearing oaths. In days of old, our ancestors would swear their oaths for the coming year (remembered today as the weaker New Year's resolutions) on the sacred boar on Twelfth Night. Now, it is our Kindred tradition to swear our oaths on a sunwheel, and then toss it into the fire as a part of our yearly Yule party. 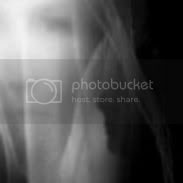 Though the family is not known in recent memory to have practiced Nordic Tradition Paganism, it is wyrd that my real father's name is Audra, a name passed down to him through his paternal line (with other males down the line also named Audra), often shortened to Aud. Aud, as a Norse boy's name, means "son of night" (related to Odin's Wild Hunt). The full name Audra (Norse Odr) is connected to a name of Odin, namely Óðr. "Odin" is generally accepted as the modern English form of the name, although, in some cases, older forms may be used or preferred. His name is related to ōðr, meaning "fury, excitation," besides "mind," or "poetry." In Norse mythology, Óðr (Old Norse for "mad, frantic, furious, vehement, eager", as a noun "mind, feeling" and also "song, poetry"; Orchard (1997) gives "the frenzied one") or Óð, sometimes angliziced as Odr or Od, is a figure associated with the major goddess Freyja. The Prose Edda and Heimskringla, written in the 13th century by Snorri Sturluson, both describe Óðr as Freyja's husband and father of her daughter Hnoss. Heimskringla adds that the couple produced another daughter, Gersemi. A number of theories have been proposed about Óðr, generally that he is somehow a hypostasis of the deity Odin due to their similarities. As well as his role as oath-god, the one-eyed deity was also regarded by the Norse as the gatherer of souls, and to this end was responsible for leading the Wild Hunt on its nightime rampages across the sky. UPDATE - Aud/Unn is also a Norse name which means "the Deep-Minded." An 18th century sketch of the Odin Stone - one of the few illustrations of the monolith we have today. The Orkney Islands of Scotland are also known by the name Orkneyjar. Orkneyjar is an Icelandic Old Norse name for the Orkney Islands. The Odin Stone, in monument to the Odin Oath, stands in Orkneyjar. This oath was an utterly unbreakable pact, the words to which are now unfortunately lost. At this time the Medes waged a great war against the Cadusii, the cause of which were as follows: Parsondes the Persian, a man far-famed for courage, sagacity, and other virtues, was at that time a favorite of the king and the most powerful member of the royal council. But this man, sorely vexed at a certain judgment of the king, fled to the Cadusii, with three thousand foot soldiers and a thousand calvary; and giving his own sister in marriage to the most powerful man in those parts, he remained there amongst the Cadusii. Having become a rebel, he stirred up the entire nation to assert their liberty; and because of his valor he was elected their general. Hearing news thereafter that a great army was being mustered against him, he armed the Cadusii en masse, not less than two hundred thousand of them all told, and he took up his position before the approaches into the country. King Artaios had taken the field against him with eight hundred thousand men, but Parsondes defeated him in battle, killed over fifty thousand of his soldiers, and repulsed the rest of his force from the land of the Cadusii. This brought him great admiration among the natives, who elected him king; and he plundered Media unremittingly, carrying desolation everywhere he went. He thus acquired great renown. In old age, as the end of his life approached, he caused his successor on the throne to draw nigh and bound him with an oath that never might the Cadusii relax in their emnity against the Medes; with a curse that utter ruin would overtake both his own progeny and all the Cadusii as well if ever terms of peace were agreed upon. For this reason then, were the Cadusii always hostile to the Medes and never subject to their king, until such time as Cyrus transferred the empire to the Persians. Thus, perhaps we have here recovered the "lost" words of the oath. Interestingly, this recount of the Cadusian oath, the oath of the king of the Cadusii, successor to General-King Parsondes, sounds alot like the Purim story in Jewish tradition about "Persian-Jewish" Mordechai and Esther whose people gloriously defended themselves following a harsh decree of the King that all of their people be killed. King Odin may be called the oath-breaker because he left the area of the Median Kingdom some time following all of these events, bringing his people to Scandinavia and its surrounding regions instead of perpetuating acts of emnity against the Medes (still under the oath of his own ancestor) to putatively avoid living under Roman occupation and subjection of the people to Rome (we are told). The Cadusii of Azerbaijan fit very well to be the proto-Vikings of history. Josephus relates the Medes (OT Heb. Madai) to the biblical character, Madai, son of Japheth. "Now as to Javan and Madai, the sons of Japhet; from Madai came the Madeans, who are called Medes, by the Greeks" Antiquities of the Jews, I:6. Other ancient historians including Strabo, Ptolemy, Herodotus, Polybius, and Pliny, mention names such as Mantiane, Martiane, Matiane, Matiene, to designate the northern part of Media. We can see how the Iranian element gradually became dominant; princes with Iranian names occasionally occur as rulers of other tribes. But the Gelae, Tapuri, Cadusii, Amardi, Utii and other tribes in northern Media and on the shores of the Caspian may not have been Iranian stock. Polybius (V. 44, 9), Strabo (xi. 507, 508, 514), and Pliny (vi. 46), considered the Anariaci to be among these tribes; but their name, meaning the "not-Arians", is probably a comprehensive designation for a number of smaller indigenous tribes. Forty years after the Emperor Claudius conquered southern Britain in 43 CE, the Roman governor, Gnaeus Julius Agricola, led a force of 20,000 troops northwards into the country known by the Romans as Caledonia (Scotland). Unlike the rest of Britain, Scotland was never considered part of the Roman Empire. The Roman armies invaded Scotland several times and even defeated the northern tribes a few times, but they never controlled Scotland. Defending their Empire - To control their newly won territory in England, the Romans built heavily defended forts around the country. Most famous of all, on the northern edge of their British territory, the Romans built a coast-to-coast wall to protect Roman England from the tribes who lived in Scotland. Hadrian's Wall was built so well, that you can still go and see parts of it today, nearly 2000 years after it was made. Some modern research suggest that the so-called Linear Elamite—which still has not been deciphered—may have been written in the language of Medes. Elamite is regarded by the vast majority of Linguists as a language isolate and has no close relation to the neighbouring Semitic languages, to the Indo-European languages, Anatolian languages or to Sumerian (a fellow isolate), even though it adopted the Sumerian-Akkadian Cuneiform script. David McAlpin proposed an Elamo-Dravidian family with the Dravidian languages of India, Vaclav Blazek proposed a relation with Semitic languages of the Near East, and George Starostin published lexicostatistics finding Elamite to be approximately equidistant from Nostratic and Semitic but more distant from Sino-Caucasian. Nostratic is a proposed language family (sometimes called a macrofamily or a superfamily) that includes many of the indigenous language families of Eurasia, including the Indo-European, Uralic and Altaic as well as Kartvelian languages. Usually also included are the Afroasiatic languages native to the North Africa, the Horn of Africa, the Arabian Peninsula and the Near East, as well as the Dravidian languages of the Indian Subcontinent (sometimes extended to Elamo-Dravidian, connecting India and the Persian Plateau). The exact composition and structure of the family varies among proponents. The hypothetical ancestral language of the Nostratic family is called Proto-Nostratic. Proto-Nostratic would necessarily have been spoken at an earlier time than the language families descended from it, which would place it in the Epipaleolithic period, close to the end of the last glacial period. Azerbaijan is the largest country in the Caucasus region located at the crossroads of Western Asia and Eastern Europe, it is bounded by the Caspian Sea to the east, Russia to the north, Georgia to the northwest, Armenia to the west, and Iran to the south. The exclave of Nakhchivan is bounded by Armenia to the north and east, Iran to the south and west, while having a short borderline with Turkey to the northwest. The earliest evidence of human settlement in the territory of Azerbaijan dates to the late Stone Age and is related to the Guruchay culture of the Azykh Cave. The Upper Paleolithic and late Bronze Age cultures are attested in the caves of Tağılar, Damcılı, Zar, Yataq-yeri and in the necropolises of Leylatepe and Saraytepe. Early settlements included the Scythians in the ninth century BC. Following the Scythians, Iranian Medes came to dominate the area to the south of the Aras. The Medes forged a vast empire between 900–700 BC, which was integrated into the Achaemenids Empire around 550 BC. The area was conquered by the Achaemenids leading to the spread of Zoroastrianism. Later it became part of Alexander the Great's Empire and its successor, the Seleucid Empire. Caucasian Albanians, the original inhabitants of the area, established an independent kingdom around the fourth century BC. During this period, Zoroastrianism spread in the Caucasus and Atropatene. Ancient Azerbaijanis spoke the Old Azari language. Caucasian Albania is a name for the historical region of the eastern Caucasus, that existed on the territory of present-day republic of Azerbaijan (where both of its capitals were located) and partially southern Dagestan. According to one hypothesis, Caucasian Albania was incorporated in the Median empire. Persian penetration into this region at a very early date is connected with the need to defend the northern frontier of the Iranian Empite. "[...] 14 haplogroups were found, where more than 90% of the Azeri population belonged to the I, U, K, T, J, H, HV, W and X haplogroups. 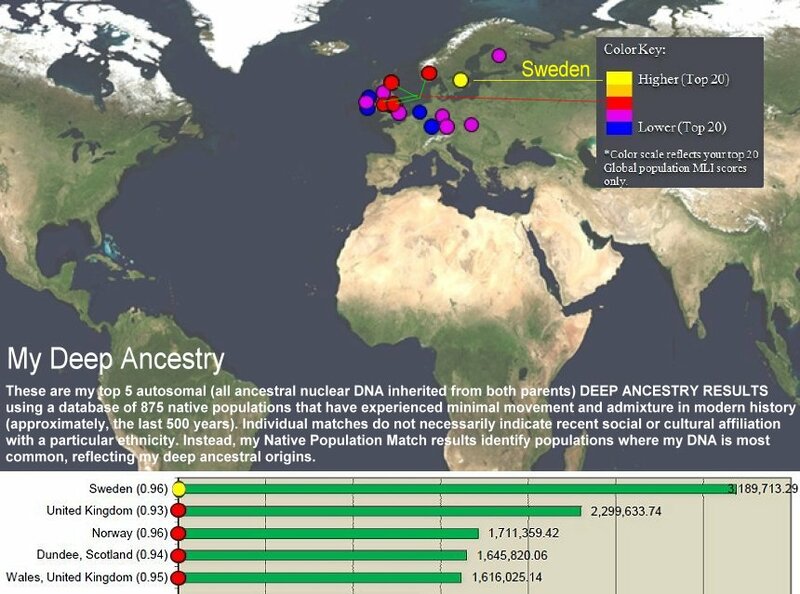 The most prevalent of these was the H haplogroup (25.57%) followed by the U haplogroup (20.3%). From the European haplogroups, 8 haplogroups H, I, J, K, T, U, W, X were found in 109 Azeris (81.96%) the West Asian haplogroup, HV, was found to be present in 13 Azeris (9.77%). Three Azeris (2.26%) with the N haplogroup and 4 others with unknown haplogroups (3%) were also observed. From the 8 Asian haplogroups (A-G, M), the A, M and D haplogroups were found in 3 Azeris (2.26%) and the African haplogroup (L) was observed in one Azeri subject (0.75%) (Table 2). [...] In this population, specific European (H, I, J, K, T, U, V, W, X), Asians (M, A, D) and African (L) haplogroups of the mtDNA have been observed, but most of this population (82%) possess the European specific haplogroups. [...] Considering the similarity between the Azeri and Iranian haplogroups (Table 3), it can be concluded that the Iranian population have been living in Azerbaijan since ancient times, and a small ethnic group who spoke the Altaic language subsequently invaded this region, as confirmed by historical documents. In the 11th century this region was invaded by 'Seljuq' Turks (Gharagheshlaghi et al., 2007) and 'Oghuz' nomadic riders (Johanson et al., 1998)." "A previous analysis of mtDNA variation in the Caucasus found that Indo-European-speaking Armenians and Turkic-speaking Azerbaijanians were more closely related genetically to other Caucasus populations (who speak Caucasian languages) than to other Indo-European or Turkic groups, respectively. Armenian and Azerbaijanian therefore represent language replacements, possibly via elite dominance involving primarily male migrants, in which case genetic relationships of Armenians and Azerbaijanians based on the Y-chromosome should more closely reflect their linguistic relationships. We therefore analyzed 11 bi-allelic Y-chromosome markers in 389 males from eight populations, representing all major linguistic groups in the Caucasus. As with the mtDNA study, based on the Y-chromosome Armenians and Azerbaijanians are more closely-related genetically to their geographic neighbors in the Caucasus than to their linguistic neighbors elsewhere. However, whereas the mtDNA results show that Caucasian groups are more closely related genetically to European than to Near Eastern groups, by contrast the Y-chromosome shows a closer genetic relationship with the Near East than with Europe." "The expanding waves of Altaic-speaking nomads involved not only eastern Central Asia [...] but also regions farther west, like Iran, Iraq, Anatolia, and the Caucasus, as well as Europe, which was reached by both the Huns and the Mongols. In these western regions, however, the genetic contribution is low or undetectable (Wells et al. 2001), even though the power of these invaders was sometimes strong enough to impose a language replacement, as in Turkey and Azerbaijan (Cavalli-Sforza et al. 1994)." "According to Thor Heyerdahlthe Norwegian mythology tells that the Scandinavian god Odin moved with his people to Norway from a land called Aser, in order to avoid Roman occupation. A 13th-century historian's description of Aser's origination matches that of Azerbaijan: east of the Caucasus mountains and the Black Sea. Heyerdahl and other scholar are convinced that people living in the area now known as Azerbaijan settled in Scandinavia around 100 AD. Roman troops arrived in Azerbaijan in 97 AD. Odin came from the land of the "Aser" (Aeser), and is, therefore, frequently referred to as "Asa-Odin" (Aser-Odin). Asgard or Ásegard is the realm of the Gods Aser in Norse religion and Norse mythology. The exact meaning of "Asgard is Aser Land or the Land of Aser". Modern day Scandinavians migrated north from the east of the Caucasus, Aserbaijan (Azerbaijan/Caucasian Albania) in prehistoric times. According to Icelandic Sagas, written in the 13th century, the Norse God Odin migrated from the east of the Caucasus, from Aserbaijan in the first century AD. Heyerdahl concluded that Azerbaijan and not northern Europe was the center from which the Caucasian people spread so that Chinese archaeologists would find their 4000 years old remains buried in northwestern China. He based that conclusion on early Norwegian sagas written down by the Icelander, Snorre Sturlason, before his death in 1241, (Snorri, The Sagas of the Viking Kings of Norway. English translation: J. M. Stenersens Forlag, Oslo 1987)." The Nature of Blot. Stephen McNallen, founder of the Asatru Folk Assembly, describes the exchange between the Holy Powers and ourselves in the Blot, or ritual blessing. My motherline haplogroup is actually, at this point in time, U5b1b1-T16192C! (alternatively written U5b1b1(T16192C)) not just plain U5b1b1. I have a back mutation at 16192 (as opposed to the straight mutation at 16192 which is present in U5b1b1). This back mutation is also present in further defined U5b1b1a, U5b1b1d and U5b1b1f, so I am at least 'one step beyond' plain U5b1b1 - the back mutation at 16192 plus the extra mutations I have mean that I will at some point in the future, have my haplogroup further defined (with a letter probably) as are haplogroups U5b1b1a,d and f.
My general mitochondrial genetic haplogroup U5b1b is shared by the Saami of Scandinavia (48%) and North African Berbers (2%) - science tells us that the mingling of peoples came in consequence to southern migrations and retreat of some of the ancient Northern European group into North Africa during the last Ice Age when most of Scandinavia and the British Isles were covered by thick glaciers. Scientists further tell us that the genetic mingling between the Saami and the Berbers occurred about 9000 YBP (years before the present). This first map shows early Neolithic cultures in Europe from approximately 7,000 to 8,000 YBP, following the re-retreat of Scandinavian U5b1 northward from their southern European and North African refugia. Researches have genetic evidence for U5b1 in the Early Neolithic Tardenoisian and Kongemose cultures in Northwestern and Western Europe. Later during the Late Bronze Age, the Tardenoisian culture is associated with Celtic Europe. Likewise, later during the Late Bronze Age, the Kongemose culture became associated with the Nordic-Germanic people. The common earlier Paleolithic root (17,000 to 9,000 YBP) of both the Celts and the Nordic peoples may be the Magdalenian Culture of Western Europe (though I'm speculating here), where mtDNA haplgroup U5 has been found in Western Europe/France. This second map shows Europe the during the Late Neolithic (5,500 to 6,000 YBP) - U5b1c has been found in the Printed Cardium Pottery Culture of Southern Europe, U5b in the Atlantic Megalithic Culture of Western Europe, and U5b1 in the Funnel Beaker Culture of Northwestern Europe. With my "extra U5b1b1 mutations" at 12366 and 13911 (which could define a new U5b1b1 subclade - with a new letter after the last number 1), this "new line" could have mostly likely arisen in either the Celtic or the Nordic areas of Europe, and most likely did between 5500-8000 YBP. Here are the defining mutations of mtDNA haplogroup U5b. This haplogroup is the foundation of Saami major motherline 1. My hapolgroup U5b1b1 is a haplgroup found among both the Saami of Scandinavia (48%) and the Berbers of North Africa (2%). Some (but not all) of the Saami also carry a mutation at np 16144, which defines a daughter haplgroup of U5b1b1, namely U5b1b1a. I don't carry this extra mutation, which may have occurred around 8000-9000 YBP. I do carry extra mutations at 12366 and 13911 "which are so far unique in U5b1b1 and could eventually define a new branch in U5b1b1" [quoting FTDNA scientist] similarly to the way U5b1b1a does among the Saami today. U5b1b1 is found throughout Europe and is ancestral to the Saami signature U5b1b1a and the Berber signature U5b1b1b. So the Saami and Berber lines are sister groups to your line with a common maternal ancestor for all U5b1b1 probably around 8,000 years ago. Another way to view this - your maternal lines defines a new branch in the U5b1b1 tree dating to about 8,000 years ago. I'd suggest trying to contact your exact match to see if your maternal ancestors are from the same country or region. It is uncertain how long ago your common maternal ancestor is with your exact match - it could be anytime between a few hundred years to a few thousand years. (I have one exact full sequence mtDNA match in the Family Tree DNA database.) Taken together with earlier information, 48% of Saami are in U5b1b1, some of them living today are even further defined as belonging to U5b1b1a - a more derived line which is not shared by the Berbers or by anyone else in Europe (which is why it is called the Saami Signature, as it is exclusive to some of the the Saami living today). U5b1b1 is still an ancestral Saami motherline and part of major motherline 1, and not all Saami living today are U5b1b1a. The Saami living today (those of major motherline 1, at least) and I share the same ancestors, though obviously, I don't live in Scandinavia and am not Saami in that sense. My motherline has developed into it's own unique branch which has yet to be exactly defined by geneticists, and which is itself a sister line to some currently living Saami (48%) and Berbers (2%). Still, my motherline is part of ancestral Saami major motherline 1. My ancient ancestors are the ancient ancestors of today's Saami, whether or not these ancient ancestors were or are called Saami or something else. My meaning when I say "my Saami ancestors" is that my ancient ancestors were the indigenous population of Scandinavia and Europe, the same as many of those Saami living in Scandinavia today. I call them Saami for convenience, since I don't know what they called themselves way back then or what scientists call them today. The key results are in the coding region, 12366G and 13911G which are so far unique in U5b1b1 and could eventually define a new branch in U5b1b1. Is that not SO COOL or what!!! When I uploaded my raw data to the mtDNA Community tool at Family Tree DNA, it also reveals that I have a back-mutation at T16192C!. The two mutations I have which place me definitely into U5b1b1 are: A7385G, T10927C. My prediction was right on target! Here are my HVR-1 differences from the new Reconstructed Sapiens Reference Sequence (RSRS), although I don't know how to interpret these results yet. These results pertain to a new system that has been developed to analyze mtDNA (using the RSRS as the phylogenetically valid reference point), and noting an individual's differences to the RSRS sequence as opposed to the Cambridge Reference Sequence (CRS). I'm still waiting for my HVR-2 and Coding Region results. This new information hasn't really changed anything in terms of my haplogroup at this point. My matches haven't changed and the only subclade showing up among my current matches is U5b1b. (LO) ordered material manifestation of the all-light, and (RI) in the spiritual order of primal air. Edred Thorsson writes, "by understanding the synthesis of these qualities, we learn an esoteric meaning of the name." In the life of the person who follows the old ways of the Teutonic people, there should be nothing unholy, no time at which you shut yourself off from an awareness of the workings of your soul simply because the thing you are doing is not openly magical or religious in its goal. Rather, you should be aware of the presence of the gods in everything. The first, and most important, re-turning of thought back to the ancient ways comes in dealing with the duality of sacred and profane as seen by the modern world. The terms themselves come from Latin roots; rooted in Anglo-Saxon, the words become “holy” and “unholy,” having very different meanings and connotations. Holy comes from a root meaning “healthy, whole,” showing that in the Germanic mind something holy is not cut off from the physical world, but rather is strong in both the earth and the worlds of the soul which are woven into it. Something unholy is not simply mundane or “non-spiritual” in the way that a profane thing is; it is something sick or flawed. To hallow a place or item is not to set it apart from the world- it is not taboo or untouchable in the sense of the Judeo-kristjan (Norse spelling of Christian) “sacred”-rather, it is filled with such a power of holiness as to ward it from any unholy-warped or woe-working-wights. Sowilo is the wholiness rune. Blessed be my Patroness Hel! She has led me to my Saami sacred name ~ Čielgat-Čiegusvuohta ~ it means to MAKE CLEAR, to clarify and to elucidate THE SECRET (ways of my ancestors as they live through me). My Saami name is in harmony with my other names: Lori (birth/English), Liorah (Hebrew), Lleucu (Celtic) and Heid (Teutonic) - all of my names pertain to bringing forth enlightenment. My Saami name is Čielgat-Čiegusvuohta. Right now, I feel like a many-layered onion with all these names, where my birth name is the outermost skin on the onion which is me. While I am still waiting for HVR-2 and Coding Region results from Family Tree DNA full sequencing of my ancestral motherline mtDNA, I have received back the HVR-1 results. These results confirm the HVR-1 results from Roots for Real. Both show my HVR-1 transitions as: 16093C, 16189C and 16270T, and both place me firmly in haplogroup U5. The only subhaplogroup showing up in my FTDNA genetic matches thus far is U5b1b, so this adds positive weight to my prediction that this will also be the subhaplogroup I am eventually assigned to when all of the results are in. The word kasdim (כשדים) in Ur Kasdim comes from the Hebrew root שדד. This root basically refers to plowing furrows before planting. Consequently, the phrase Ur Kasdim refers to an "original farming community" which has learned to harness nature and to reliably produce food, enabling a relatively settled lifestyle (in contrast to a hunter-gatherer lifestyle) - Ur Kasdim could have been located anywhere. Knowing the root from which the name of the "original homeland" of Abraham is derived gives us a clue to the actual directive given to Abraham. The directive was specifically to spread the technology of farming to a largely hunter-gatherer human population. Farmers may have went out into the world in all directions from this original first farming community. Abraham's clan may have been one clan of many given this directive - to spread the knowledge of farming to the rest of the human family. The word Urheimat is a German word (of the Uralic linguistic family of languages) which is a compound of Ur- "primitive, original" and Heimat "home, homeland" and is a linguistic term that denotes the homeland of the speakers of a proto-language. Ur is the "original homeland" of Semitic Abraham. The word Ur, in both a Uralic and a Semitic language, means "original".